Hello my name is Chelsey. I was born May 26, 2005 to Stephanie Coleman and Jara Green. My parents broke up when I was young. My mother was a single mother for a while. I always talked to my father and visited him. I visited him in Texas this summer. They both spoil me. My Grandfather died in 2013 around Christmas to cancer. I never really got to know him, but I know he was an amazing person. I found out that he died on Christmas, which is my mom’s birthday. It was sad to see everyone cry. In 2014, my mom started dating an amazing man named Eric Jones -who I now call my dad. He takes care of me and spoils me. He has 4 children. My sisters and brothers are from another mother. They are all incredible. This year I started middle school. I have to tell you, it is very different from elementary. I’ve met new friends, new cool teachers and seen some people I already knew. I learned new things, and have taken classes on subjects I’ve never had before. My favorite subject is Aerospace. In it, we learn about anything that can fly. I’m in Pre AP classes, and I get to take the ACT aspire as a sixth grader. I feel really proud of my test scores and grades. When I grow up, I want to either be a teacher or, a lawyer. I want to be a teacher because I like working with other kids. I want to be a lawyer because I like justice. Even though I will have to go through law school, I will be glad to do it.Thank you for reading about my life. I’d like to hear about your story. We all have one. There is a Comment Box below that you can use. What’s your story? Chelsey (pictured right) promoted the first edition of The Bully Diaries from Barnes & Noble on the Plaza in Kansas City, MO last year. She is a very active member of our Writing for the Soul Workshop™ program. Chelsey’s goal for college is to work hard to earn a scholarship, and to save money she earns from selling our books and eBooks. When you download The Bully Diaries, Chelsey earns $3 and Stand For The Silent receives a $3 donation. Your purchase also ensures that participants like her can continue to access Writing for the Soul Workshop™ at no cost to them. During checkout, enter Coupon Code: chelsey72 to get the eBook for only $9.99. You save $2.00! Chances are that you experienced bullying in your life. Whether your experience was as a victim, a bystander or the bully, if you search your memories, you will probably find instances when bullying was a part of your life. For many of us, these experiences have defined us and shaped us. Our experiences made us stronger, and helped us become who we are today. When you are being bullied, it is hard to think about much more than getting through today. For others, there is no today. Their experience being bullied was too overwhelming, and drove them to a devastating and permanent solution to the temporary pain. Through a community partnership with Stand for the Silent, Writing for the Soul Workshop collected stories, letters and poems from youth, teens and adults from around the world. These stories are pieces of lives impacted by bullying; written to show everyone affected by bullying that you are not alone, that you can survive the experience, that you are somebody. A portion of the proceeds from book sales goes to support Stand for the Silent. Stand For The Silent exists as a platform that has allowed its Founders’ Kirk and his wife Laura to travel and speak to over a 1,000,000 kids in over 1,200 schools. 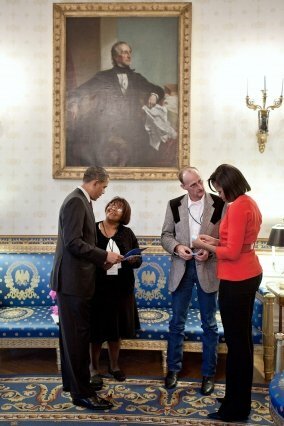 In the photo, Kirk is pictured here speaking with First Lady Michelle Obama.